James Comey has been fired by President Trump. It’s a good first step toward draining the swamp. If Trump holds to form, more people will be fired. Trump has never tolerated incompetence. Comey refused to prosecute crooked Hillary Clinton because he said Hillary had no ‘intent’ to commit crimes. Comey had no right to decide Clinton’s guilt or innocence. That should have been left to the courts. The evidence against Hillary was overwhelming, and she still needs to be locked up. Intent has no bearing on case. Comey also claimed he was looking into Trump’s ‘Russian’ connections, which were non-existent. Hillary invented the Russian story to deflect from her criminal activity while also providing her a convenient way to blame ‘Russian hackers’ on her defeat. The corrupt mainstream media breathlessly spread this fake news. Hillary had more to do with Moscow than Trump ever did. Bill Clinton raked in $500,000 for a speech there. Shortly thereafter Hillary allowed a Russian company to gain control of a large percentage of US uranium reserves. Classic pay for play. But Comey didn’t investigate that, which was a real scandal—oh no. 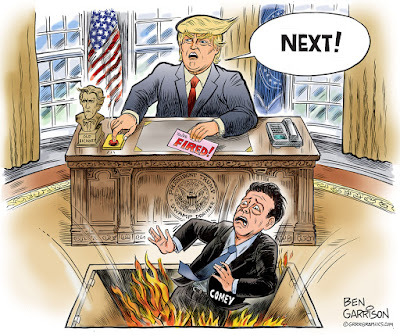 Comey allowed the FBI to become a political tool for his deep state masters. Comey was also a bumbler. He repeatedly failed to pursue chances to end incidences of Islamic terrorism. He granted Hillary’s aides immunity unnecessarily and allowed evidence to be destroyed. He didn’t investigate Obama's scandals. He was, after all, appointed by Obama. Let’s hope Trump continues to drain the swamp. Firing Comey is a good first step.